This painting is characteristic of Bale’s work; he specializes in grapes (which feature in many of his pictures), often with other combinations of fruit. He also produced a large number of gamepieces, which would have been popular decorations in English and Scottish country houses, sometimes with grouse, as here, but more frequently with mallards and ducks. Like William Gowe Ferguson [q.v.] he could paint feathers with great skill, conjuring their airy texture with minute brushstrokes. Little is known of Charles Thomas Bale (fl.1868-92), save that in 1872 he exhibited at both the Royal Academy and the Society of British Artists in Suffolk Street. 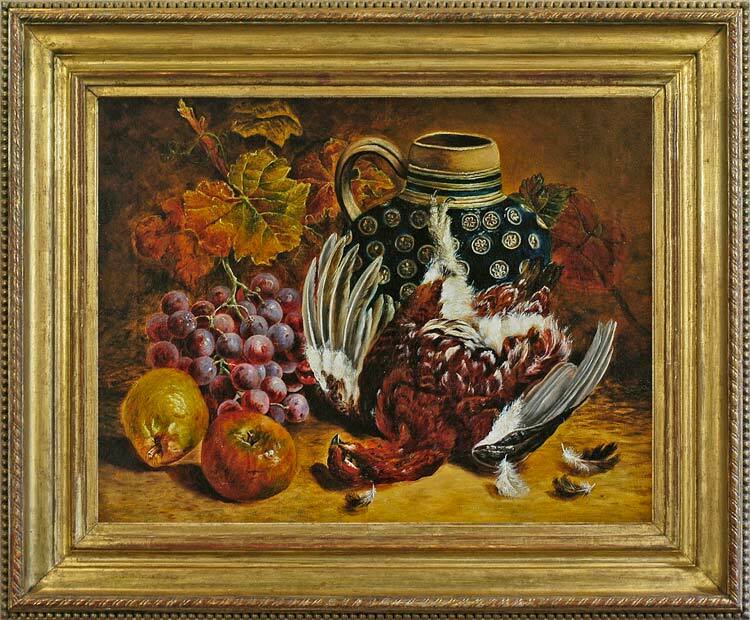 He was an extremely prolific artist, producing hundreds of still life paintings which depict various combinations of fruit, flowers, birds’ nests, game, silver and earthenware jars. These seem to be almost entirely in private collections, possibly because of their domestic scale and decorative content; although the work of many of his peers (Eloïse Stannard, Oliver Clare and William Henry ‘Bird’s Nest’ Hunt) has been more openly recognized.